In recent decades, the concerns of researchers in both developed and developing countries have increasingly been related to the role of entrepreneurship in economic and social development. This interest has been reflected, among other things, by taking into account the entrepreneur and his relational network as determining factors in the development of the entrepreneurial process and by identifying the determinants of entrepreneurial success. The proliferation of research and the accumulation of knowledge have not reinforced the clarity of work on the entrepreneurial opportunity, now divided between two theoretically irreconcilable approaches. It was with the work of Shane and Venkataraman that the process approach was adopted to study entrepreneurship . The entrepreneur no longer defines entrepreneurship but is the main actor among other actors and factors. Indeed, Shane and Venkataraman identify entrepreneurship as an in-depth examination of how, by whom and with what results are discovered, evaluated and exploited opportunities for the creation of future goods and services . In the same context add that individuals and opportunities are "first order forces" that explain entrepreneurship. Moreover, "they think that, to explain entrepreneurship, researchers must focus their attention on individuals and opportunities . Churchill and Muzyka emphasize that entrepreneurship involves an act undertaken by an individual who innovates by creating value through the identification and development of opportunity and the transformation of opportunity into a viable product or service . The recognition of entrepreneurial opportunities has begun to occupy a privileged place in entrepreneurial research. Several authors consider it to be a central and major element of entrepreneurship . In this respect Shane and Eckhardt defined entrepreneurial opportunities as situations in which new goods, services, raw materials, markets and organizational methods can be introduced by new means or ends [2,5]. In a world of continuous change, the entrepreneur must identify new business opportunities that exceed his current skills and exploit opportunities at the right time. And this, in order to ensure the development and survival of his company [6,7]. From the moment when entrepreneurship occurs only at the connection between an individual and an opportunity, the proper study of the recognition of opportunities involves the study of the individual and his social capital. It would therefore be important to know how entrepreneurs create the social capital of nascent companies and how they manage to use it to identify new business opportunities . To achieve our goal of discovering the importance of social capital as a stimulator in the recognition of business opportunities in our region, we have proposed the following main question: "What is the impact of social capital on the recognition of new entrepreneurial opportunities in the South-West of Tunisia?" In our research, the goal is to contribute, on the one hand, to the theory of the entrepreneurial opportunity, and on the other hand, to the practice of this discipline. In recent years, the literature on social capital has developed remarkably . The central proposition of social capital theory is based on the argument that social networks are an important resource for doing business. Referring to social networking approaches, the concept of social capital makes two important aspects of networks more explicit . First, through the use of the term "Capital", the strategic, economic and productive value of social relations is made explicit. On the other hand, in addition to the structure of the network of relationships of an individual or a group, approaches to "social capital" generally take into account resources that actors have access to through these networks . 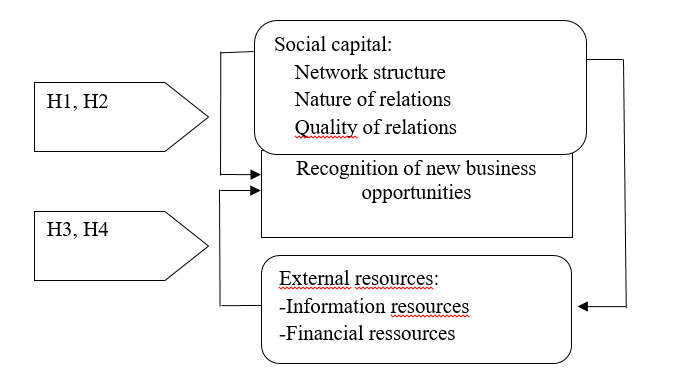 For Bourdieu, social capital refers to "all the real and potential resources linked to the possession of a durable network of more or less institutionalized relations of mutual knowledge and recognition . Coleman states that this key concept includes the knowledge, norms and rules shared and used by individuals in their interactions . Burt (2001) states that social capital is the totality of lifelong contacts and relationships that one associates with one's financial and human capital, leading to the identification of new ones business opportunities [13,14]. In general terms, social capital refers to the relational networks of an actor, whether individual or collective, and the resources that can be mobilized through these networks [11,15]. In their research, Adler and Kwon point out two major perspectives  on the concept of social capital: An external perspective: In this perspective, the focus is on the links that a focal actor has with other actors . Previous studies that relate to this perspective focus on the characteristics and dynamics of a target actor's networks with other actors, and the resources they mobilize through these networks . An internal perspective: In this perspective the focus is on the links that a focal actor maintains within a group or a community . Previous studies related to this perspective include the quality of relationships among group members (organization, region, country), and the impact that social capital can bring to this group [10,16]. The notion of opportunity is a central issue of entrepreneurship in that the process of recognizing opportunities, with a specific entry on the identification of business opportunities, is one of the important steps in any creation of entrepreneurship business . To better understand what the entrepreneurial opportunity is and the factors that explain it, Tremblay and Carrier identify three perspectives : The first perspective is objectivist: Thus, the authors predict that the opportunity exists independently of the individual, thus speaking of a process of identification and / or discovery greatly influenced by the information available and the vigilance of the entrepreneur . According to this perspective, an entrepreneurial opportunity is a market imperfection or an economic imbalance that can be exploited by bringing the market back to its equilibrium state. This implies that opportunities exist all around us in space and time, but it is only the individuals with "vigilance" who possess the ability to identify them [22,23]. The second perspective is subjectivist: It refers to an essentially cognitive process of recognition or perception and exploitation of opportunities that depends on the personality and ways of thinking of the future entrepreneur . And therefore, an entrepreneurial opportunity exists in this context, only when the individual develops a model for the exploitation of his idea . The third perspective is constructivist: It explains the creation and development of opportunities through learning processes that can be done through social and relational networks. Here, the creation and development of opportunities is realized only through the coupling between the processes of learning and creativity. In this respect, social construction thus appears as the fruit of a cross between subjectivity and objectivity [25,26]. Nahapiet and Ghoshal have shown that social capital comprises three interrelated dimensions : The structural dimension: This dimension focuses on the structure of the network by focusing on the composition of links and the configuration of this network. The two most prominent structural elements in the social capital literature are size and heterogeneity [27,28]. Structural social capital corresponds to all the relations present within a social structure. It is more precisely the configuration of the network, the stability of the network and the nature of the links that unite the members of the network. The relational dimension: This dimension corresponds to the nature of the relationships that the actors have developed between them through their stories, the feelings of obligation, trust, norms, etc. Relational social capital is characterized by a high level of trust among network members, the sharing of norms and obligations, and mutual identification . Affective social capital and relational social capital can be assimilated respectively to the concepts of strong links and weak links developed by Granovetter. The cognitive dimension: This dimension refers to the level of collective understanding among network members (shared representations and interpretations) . The cognitive dimension of social capital incorporates not only common languages and narratives, but also a shared vision that allows members of the organization to perceive and interpret events in a similar way . The analysis of the literature on the concept of social capital highlights three dimensions that make it possible to measure its greater or lesser richness: size of the relational network, Nature of social links, and quality of social links [28,30]. Burt from several studies, have deduced the importance of social networks in the process of identifying opportunities, with particular emphasis on the importance of having an extensive relational network [31,32]. In Burt's logic, by being in contact with distinct networks, the individual is confronted with different ways of seeing, he is aware of the shortcomings of the various networks, which allows him to be in an ideal position to innovate . The entrepreneur who has an idea will indeed try to test it with various people and bodies. Burt's structural hole concept, as well as that of weak links of Granovetter seem stimulating in that they explicitly introduce the idea of access to non-redundant networks and thus to separate information. Aldrich and Carter and Kim and Aldrich indicate that in the United States, most people have between five and twenty strong links, but that with regard to entrepreneurial networks they have a few more links weak, without, however, specifying the number [33,34]. De Koning proposed a socio-cognitive framework of opportunity identification . Its framework proves that entrepreneurs evolve opportunities by pursuing three cognitive activities (gathering information, thinking when speaking, and resources evaluated) through active interaction with an extensive network of people . This network includes the inner circle of the entrepreneur (the set of people with whom a contractor has long-term and stable relationships, they are not partners in the company), all the actors (the people recruited by the contractor to provide the resources needed for the opportunity), the associations (start-up team members) and a network of weak links (a network collected general information . In addition, by emphasizing the nature of relationships and the recognition of new opportunities, a high density of the network (large number of links) could influence the identification of opportunities . However, to have a positive influence, the network should also include relationships characterized by strong links, a number of weak linkages, giving access to information not only varied but also likely to lead to innovation [38,39]. An important source of opportunities may be the social networks of entrepreneurs. The weak links and the structural holes (Burt, 1992) in a network may be indicators of the accessibility of information that could lead a potential entrepreneur on one occasion . Weak links are casual acquaintances that do not require individuals to spend a lot of time or contact to maintain rapport (as opposed to strong ties). This type of link is especially important to provide access to new information and thus foster innovation . Mark Granovetter points out through a large empirical study, how job search is facilitated by having "relationships", and contacts, with people who are in related networks and usual networks . The social structure of the network of entrepreneurs and the quality of links in the network can be predisors of opportunities to identify the opportunity of an individual. H1 The extent of the relational network and the nature of the relationships that the entrepreneur has developed is positively related to the identification of entrepreneurial opportunities. The social behaviors of the entrepreneur have an impact on his ability to identify opportunities. Christensen states that in order to facilitate the identification of opportunities, it is necessary to foster the acquisition of a deep knowledge of a domain, or to regroup with the individuals who possess this knowledge . Social capital can provide access to varied but reliable information, a sense of belonging, loyalty and trust, and supportive relationships that reduce uncertainty .Generally, social relations are reinforced by interactions between actors . The existence of interactions is a necessary condition for the development and maintenance of a dense social capital . Cooperation within the social network is nourished by contacts, regular dialogues, in other words sociability between members of the network. H2 The entrepreneur's social behaviors have an impact on his ability to identify opportunities. The possession of a network of lasting relationships in the location of the company allows a better integration in this environment and to gain the recognition of the actors of the territory. Social networks can thus be scrutinized as a reservoir of resources, whose information is only one dimension. The social relations mobilized constitute a capital to disseminate information that requires financing . The authors identify access to information as the first factor influencing the identification of opportunity . Shane speaks of "information asymmetry" to refer to the differences individuals have in relation to access to information . These authors suggest that the level of knowledge held by the entrepreneur conditions its ability to acquire new knowledge related to each other . The entrepreneur can rely on weak links. He can mobilize relations acquired in particular in his past experience, in order to subject his project to criticism in front of interlocutors who possess complementary knowledge and positions of his own. The network of relationships between managers in different divisions can have an impact on the sharing of information, the creation of common and shared strategic objectives, as well as on changes in inter-unit links . According to Yu, the individual accumulates information and knowledge according to his experiences, and it is from this pool of knowledge that he interprets the outside world, an interpretation that enables him to identify opportunities . According to Vandekerkhove, the identification of new opportunities is restricted by the personal limits of entrepreneurs, especially in the phase of consultation and analysis of information. Singh in particular highlighted the impact of so-called weak ties on the ability to identify opportunities. Of the 256 entrepreneurs participating in the study, those with a weak-tie network identified more ideas and opportunities than those with smaller networks. Beyond the actors with whom the focal actor has a direct relationship, it is important in the analysis of his network to also consider indirect contacts, since this type of contact also represents a source of benefits and a wealth of useful information for detecting new opportunities . Social capital is recognized to open up new possibilities by providing access to useful, reliable, proprietary and non-redundant information . It also serves as a mechanism for appropriating and representing the environment. H3 The more the individual is supported by an immense network dominated by weak links, the more he will have a stock of varied information, and he will be able to detect new opportunities. The contractor network is a significant source of resources. However, and usually start-ups start their careers with financial resources insufficient. Entrepreneurs use their social capital to help solve this problem. To start a business, and this even in a technology spin-off approach, one of the main sources of financing entrepreneurs, apart from their own savings and bank loans, can be family, friends (strong links), and agencies (weak ties). To reduce the intensity of financial problems that are likely to jeopardize the future of his business, the entrepreneur can use his personal relationships to mobilize the necessary funds for his business . It can, in particular, rely on privileged relations with the heads of credit institutions to obtain better access to financial resources. This can result in more easily and cheaply obtaining funds and other financial resources (cash, payment facilities, credits, etc.). During the exploitation phase of business opportunity, local networks (strong links) will continue to play an important role in the search for funding and the local . H4 The more the individual is supported by a large financial network dominated by strong bonds, the more likely he is to increase his financial possibilities, and he will be able to detect new opportunities. On the basis of this literature review, we have developed a conceptual model of research adapted to a specific category of individual. This conceptual model, aimed at restricting the theoretical model of research, presented in the two previous sections. The following diagram illustrates all the variables retained by this research as well as the links that connect them (Figure 1). This study aims at explaining the endogenous variable (recognition of opportunities) by a set of metric variables (size of the social network of the entrepreneur, number of strong links, number of weak links and number of links with senior people). Placed, access to information resources and access to financial resources). In order to explain the determinants of our endigenic variable, we will follow a hypothetico-deductive approach. This is to conduct a questionnaire survey, our target population are the emerging entrepreneurs appeared in the city of Gafsa, Tozeur and Kebili during the year 2018. The sample is constituted in part by individual survey, we ask each interviewee to give us the contact details of other entrepreneurs and by reference to a list obtained from the national social security fund concerning the new employers affiliated during the year 2018 Thus, seventy visits of entrepreneurs were made. This sample represents approximately 14% of the target population. Thus, in our study we will use the convenience sampling method which is a non-probabilistic method. This search chooses a questionnaire with closed questions, or the interviewed entrepreneur must choose between a limited number of predetermined answers. The forms of closed questions used in this study are of the dichotomous or multi-homotomic type, and proposals on which it is advisable to give an opinion through a 5-position Likert scale. For the elaboration of the questionnaire, an exploratory pre-survey was conducted among ten entrepreneurs from the region of Gafsa, Tozeur and Kebili. This pre-survey provided sufficiently nuanced answers that could allow the pre-formulation of closed questions during the survey. Subsequently, a survey questionnaire was developed, validated and pre-tested in order to verify the likelihood of advanced research hypotheses. The initial version of the questionnaire was pre-tested with five entrepreneurs. After delineating the methodological choice adopted in this research, the results of the questionnaire were analyzed using SPSS software (version 11). All Gronbach alphas are greater than 0.5. The measurements are considered satisfactory. The significance of Bartlett's Sphericity Test holds the nullity for each variable, which makes it possible to reject the global non-correlation of the variables. The factor structure obtained for all the variables is satisfactory because it explains more than 50% of the total variance. The study of the dimensionality of the different variables indicates that it is unidimensional. Given that the recognition of entrepreneurial opportunities is a multidimensional concept, its explanation could not be restricted to a few variables. For this reason, a discriminant analysis was carried out on all the variables in order to select the most revealing variables of the differences between the two groups in terms of identifying opportunities. Using the group mean equality test, all variables are significant and therefore the recognition of entrepreneurial opportunities can be explained by all the variables exposed. These variables have the largest Fs with p-values less than 5%. Moreover, according to Wilks' lambda statistics these variables seem to have an influence with values close to 1. (Table 2) There is no unequivocal measure of the relative importance of independent variables in discrimination between groups. Nevertheless, we can estimate the relative importance of the independent variables by examining the absolute value of the coefficients of the function discriminant. (Table 3) It can be seen that the variable "nature of social links", particularly strong links, is the most discriminating variable. Indeed, the results show that in the Tunisian landscape the strong links constitute a source of identification of opportunities more important than the weak links and the notion of structural holes. This is an observation often observed in the developing countries and which expresses the cultural weight and the social pressure of these zones. These results are in perfect harmony with the studies of Nkakleu who conducted a pilot study in the Cameroonian context. Indeed, this author found that the notion of links strong describes the trust, reciprocity and emotional intensity in interpersonal relationships and significantly affects the business world, It denotes that the opportunity identification phase is reflected here by the mobilization of the primary relational network (strong links symbolizing the relationships with the knowledge and close relations of the entrepreneur). In this respect, these exchanges between the entrepreneur and his family corroborate the conclusions of the work done by De Koning . On the contrary, Davidson and Honig find the opposite result by studying the case of the United States. Indeed, in developed countries, access to information and the recognition of opportunities mainly involves the network of weak links testing this hypothesis allowed Hills to state that "entrepreneurs who have an extensive network identify significantly more opportunities. » Similarly, the results show that in the Tunisian context, nascent enterprises usually have few resources and entrepreneurs use their social capital to help solve this problem. Our results are similar to studies by Uzzi and Gillespie who have shown that interpersonal relations between the banker and the entrepreneur have positive effects on credit conditions. In fact, entrepreneurs who are linked to their bankers through strong interpersonal relationships can, thus, access financial resources more easily and cheaply through the interpersonal trust that characterizes this type of relationship . This gives more to the survival of his company, this finding is consistent with the work of Henri and Edson (2012). Indeed, the study shows that thanks to social capital, SME with access to bank credit survive longer than others, and this, thanks to the importance of relations forming the social capital in the financing of SME. In general, people only give credits or lend money to someone in whom they have a minimum of confidence or to whom they have a moral or psychological duty, that is, to people with whom they have close ties, such as close friends or relatives. Recognition of opportunities has begun to occupy a prominent place in entrepreneurial research, and work on it is constantly growing. Opportunity recognition studies to date in the field of entrepreneurship have shown its importance as a central and unique element of entrepreneurship. In addition, there is a consensus that entrepreneurship is the process through which new economic activities and organizations are born [51-53]. Shane and Venkataraman have shown that opportunity is a determining factor in this process by introducing the opportunity-individual interrelation that creates, develops and conditions the entrepreneurial process . In management sciences, the literature on social capital has been developing rapidly in recent years [54-68]. The central proposition of social capital theory is based on the argument that networks of social relations are a valuable resource for the conduct of business because they facilitate economic action and allow entrepreneurs to expand their scope, save their resources and access exclusive resources and opportunities [15,33]. As such, this study aims to contribute to the field of entrepreneurship research by focusing on the process of entrepreneurial opportunity (identification and exploitation of opportunities). In order to answer the research problem built around the impact of social capital on the recognition of new entrepreneurial opportunities, we adopted the guided interview with a questionnaire survey. Interview results and data analysis identified interlocking endogenous factors that led to the identification of new business opportunities. The interpretation of the results of our research from a factor analysis to a discriminant analysis showed that entrepreneurial social capital and the advantage offered by the latter to access information and financial resources significantly affect the recognition process entrepreneurial opportunities. Indeed, being in contact with individuals with diverse relationships, and being at the interface of "structural holes", allows the entrepreneur to benefit from access to information and information distinct resources and therefore the possibility of recognizing a new entrepreneurial opportunity. Shane S, Venkataraman S. The Promise of Entrepreneurship as a Field of Researc Acad Manag Rev. 2000; 25: 217-226. Shane S, Venkataraman S. Entrepreneurship as a field of research. Acad Manag Rev. 2001; 26: 13-16. Churchill NC, Muzyka D Defining and conceptualizing entrepreneurship: a process approach. In: Marketing and Entrepreneurship, Quorum books, 1994; 11-23. Zouhayer M, Anis J. The factors of the lack of reimbursement of the microfinance institutions: Empirical evidence in the case of the Tunisian micro-borrowers, Int J Inf Bus Manag. 2013; 5: 139-158. Eckhar JT, Shane SA, Opportunities and entrepreneurship. J Mana 2003; 29: 333-349. Shane S. A General Theory of Entrepreneurship - The Individual - Opportunity Nexu Cheltenham, Edward Elgar Publishing, 2003. Zouhayer M, Tarek BH, Hanène Kh, Anis J. The contribution of behavioral finance in the decision of the microcredit granting: empirical application to the Tunisian AMC case. Management and Administrative Sciences Review. 2016; 5: 302-325. Zouhayer M, Anis J. Entrepreneurial culture, profile of the leader and entrepreneurial orientation: Empirical application in the case of the Tunisian companies, Manag Strat J. 2013; 22: 18-25. Zouhayer M, Basma J, Anis J. Selection of projects of future contractors by the Tunisians organizations of accompaniment. Global Advanced Research J Manag Bus Stud. 2014; 3: 506-518. Lin Social capital: a theory of social structure and action. Cambridge: Cambridge University Press, 2001b. Bourdieu P. The forms of capital. In J G Richardson, Handbook of theory and research for the sociology of educatio 1986; 241-258. Coleman JS. Social capital in the creation of human capital. Am J So 1988; 94: 95-121. Burt RS. Structural holes versus network closures as social capital. Global Entrepreneurship Monito 2004 Financing Report. wellesley-London:babson College and London business School. 2001. Zouhayer M, Anis J. The Factors behind the repayment failure of the AMC micro-borrowers in Tunisia: a test across the cognitive approach, Management and Administrative Sciences Review. 2014; 3: 660-682. Nahapiet J, Ghoshal Social capital, intellectual capital, and the organizational advantage. Acad Manag Rev. 1998; 23: 242-266. Zouhayer M, Tarek BH, Anis J. Mediating effects of management of information on the relationship between mechanisms of governance and lack of reimbursement of Tunisian’s associations of microfinance, J Know Econ. 2018; 9:40-61. Zouhayer M, Anis J. Determinants of the performance of refunding in microfinance: Empirical application for the case of Enda-Interarabe of Tunisia, Manag Admin Sci Rev. 2014; 3:355-377. Mohamed Taher k, Zouhayer M, Asma S. The financing of SME in the South-West Tunisian: Between the current potential and challenges to be overcome. J Am Res Econ. 2018; 10: 176-195. Tremblay M, Carrier C. The identification of entrepreneurial opportunities: a collective perspective. XVth International Conference of Strategic Management, Annecy, June, 2006. Schumpeter JA. The theory of economic development. London: Oxford University Press, 1974. Gartner WB, Carter NM, Hills GE. The language of opportunity, In: New Movements in Entrepreneurship. Edited by: Chris Steyaert and Daniel Hjorth, Edward Elgar, Cheltenham, UK, 2003; 103-124. De Koenig A, Opportunity Development: A Socio-Cognitive Perspectiv in KATZ J. Advances in Entrepreneurship, Firm Emergence and Growth. JAI Press/Elsevier, Oxford, 2003; 6: 265-314. Hills G, Shrader R, Lumpkin GT. Opportunity Recognition as a Creative Process. In: Frontiers of Entrepreneurship Research, Eds Reynolds Bygrave P, ShaverW, Mason K, Manigart C, Meyer S, Sapienza GD, et Wellesley H, M.A: Babson College, 1999. Davis AE, Aldrich AE. The organizational advantage? Social capital, gender, and small business owners’ access to resources. Paper presented at the Annual Meeting of the American Sociological Association, Washington, DC, 2000. Batjargal Effects of networks on entrepreneurial performance in a transition economy: The case of Russia. In P. E. Reynolds, WD Bygrave, N M, Carter S, Manigart C, Mason GD, Meyer K. Shaver, (Eds. ), Frontiers of entrepreneurship research. 2001; 97-110. Bolino MC, Turnley WH, Bloodgood J. Citizenship behavior and the creation of social capital in organizations. Am Manag Re 2002; 27: 505-522. Burt RS. The contingent value of social capital. Administrative Science Quarterly, 1997; 42: 339-365. Burt RS. Structure holes: The structure of social capital competition. Cambridge, MA: Harvard University Press, 1992. Granottever M. The economic sociology of firms and entrepreneurs. in Portes (eds) The Economic Sociology of Immigration. Essays on networks, Ethnicity and Entrepreneurship, Nwe-York: Russel Sage Foundation, 1995. Aldrich H, Carter N M. Social networks. In W. B. Gartner, K. Shaver, N. M. Carter and P. D. Reynolds (Eds. ), Handbook of entrepreneurial dynamics: the process of business creation Thousand Oaks: Sage, 2004; 324-335. Kim PH, Aldrich HE. Social capital and entrepreneurship. Boston: Now, 2005; 1. Zouhayer M, Anis J. Behavioral finance and the lack of reimbursement: empirical application in the case of Tunisian isnstitutions of microfinance. Ind J Manag Sci, (IJMS). 2014; 4:19-31. Singh R P, Hills GE, Hybel R C, Lumpkin G T. Opportunity recognition through social network characteristics of entrepreneurs. in Reynolds P D, Bygrave W D, Manigart S, Mason C, Meyer G D, Sapienza H T, Shaver. K (dir. ), Frontiers of entrepreneurship research, MA: Wellesmey: Babson College, 1999 . Davidsson P, Honig B. The role of social and human capital among nascent sentrepreneurs. J Bus Ven 2003; 18: 301-331. Arenius P, Clercq DD, A Network-Based Approach on Opportunity Recognitio Small Bus Econ. 2005; 24:2 49-265. Granovetter M. The strength of weak ties. Am J Sociol. 1973; 78: 360-1380. Granovetter M. Economic action and social structure: the problem of embeddedness. Am J Soc. 1985; 91: 481-510. Christensen PJ, Madsen OO, Peterson R. Opportunity identification: The contribution of entrepreneurship to strategic management. Denmark: Aarhus, University Institute of Management, 1989. Tarek BH, Zouhayer M, Adel G, Entrepreneurial Competitive Intelligence between Uppsala Model and Born Global Theories in the case of North African SMEs, J Knowl. 2017; 5: 1-22. BARON R Opportunity recognition as pattern recognition: how entrepreneurs “connect the dots.to identify new business opportunities, Am Manag Persp. 2006; 20: 104-119. Shane S. A General Theory of Entrepreneurship - The Individual - Opportunity Nexus. Cheltenham, Edward Elgar Publishing, 2003. Ravasi D, Turati C. Exploring entrepreneurial learning: a comparative study of technology development projects. J Bus Venturing. 2005; 20:137-164. Yu TF. Entrepreneurial alertness and discovery. The Review of Austrian Economic 2001; 14: 47-63. Lazega E. Réseaux sociaux structures relationnelles. Paris: Presses universitaires de France, 1998. Nkakleu R. Would business tontines be a tool for developing social capital in an African context? Lessons from the Cameroonian case. Communication presented at the days organized by the AGRH and AIMS on the theme Management and social networks, ESC Clermont Ferrand, 2007b. Uzzi, Gillespie. Knowledge spillover in corporate financing networks: Embeddedness and the firm's debt performance. Strategic Manag 2002; 23: 595-618. McMullen JS, Dimov D. Time and the entrepreneurial journey: the problems and promise of studying entrepreneurship as a process. J Manag Stud. 2013; 50: 1481-1512. Wiklund J, Davidsson DP, Audretsch B, Karlsson C. The future of entrepreneurship research. Entrepreneurship Theory and Practice. 2011; 35: 1-9. Kirznerm IM. Perception, opportunity and profit, Chicago: University of Chicago Press, 1979. Stevenson HH, Jarillo-Mossi JC.A paradigm of entrepreneurship: Entrepreneurial management. J Bus Str. 1990; 11: 17-27. Schumpeter JA.The theory of economic development. Cambridge, MA: Harvard University Press, 1934. Mohamed TK, Zouhayer M, Asma S, Sami B. The financing of SME in the south-west of Tunisia: Between the current potentiel and the challenges to be overcome. J Am Res Econ. 2018; 10:176-195. Kirzner IM. Discovery and the Capitalist Process. University of Chicago Press, Chicago, IL, 1985. Davidsson P. Entrepreneurial opportunities and the entrepreneurship nexus: A re-conceptualization. J Bus Venturing, 2015. Abdulaziz M, Worthington A. Small and medium-sized enterprises financing: a review of literature. Int J Bus Manag. 2013; 8: 36-54. Wamba H. Social Capital and Access of African SMEs to Bank Credit: The Case of Cameroon, J Manag Sci, Manag. 2013; 259-260. Aldrich H, Elam A. Strong ties, weak ties, and strangers: Do women owners differ from men in their use of networking to obtain assitance. The Small Business Foundation of America. Working paper 4, 1995. Encyclopaedic Dictionary. Le Petit Larousse. French Editions Inc, 1995; 193. Mwangi I, Ouma A. Social capital and access to credit in Kenya. Am J Soc Manag Sci. 2012; 8-16. Ngoa H, Niyonsaba E. Access to Bank Credit and Survival of the Cameroon SME: Role of Social Capital, Trust Africa. Af J Econ Manag. 2012; 1: 111-136. Zouhayer M, Anis J, Mechanisms of the governance in microfinance and the rate of reimbursement: Empirical application to the Tunisian case. Afr J Sci Res. 2: 27-36. Figure 1: Proposal a model for research. Table 1: Results of the factor analysis relating to all the studied variables. Table 2: Test of equality of means between groups. Table 3: Standardized Coefficients of the Canonical Discrimination Function.